Every Manipuri (particularly among Meiteis) loves to see 'Shumang Leela' because it is the hottest among the performing arts of the state. However, it is also popular among other communities like Meitei Pangal (Muslim), Tribal communities etc. When 'Titanic', the blockbuster movie from Hollywood swept all over the world, it couldn't move an inch of audiences of 'Keishamthong Thoibi', a blockbuster shumang leela. It reached nearly 500 shows. Around two thousand spectators gathered in a show however, it varied from courtyard to courtyard according to the size of the courtyard. Shumang leela officially was recorded for the first time in the state in the year 1918 with 'Harischandra' leela. However, its concept was started much earlier during the reign of king Chandrakriti (1851-1886) in clown form. Some scholars opined that shumang leela descended from Lai Haraoba, a ritual ceremony of pleasing god by men, going up to mythology period. The present form of shumang leela is developed between the proscenium theatre and the said clown form. Films particularly from bollywood influenced in the latter period. Two names Aribam Amubi Sharma and Lairenjam Chaoba are worth mentioning in the evolution of shumang leela. The other art forms like Ramleela, Udukhul, Shan Shenba etc. had contributed to its nursery period. 'Shumang' means 'open courtyard' and 'leela' means play and literal meaning of Shumang leela is "play of the open courtyard". It has affinity with proscenium theatre in form however it is performed in an open courtyard surrounded by spectators on all four sides. Besides, male artistes act in the female role. Some of the male artistes in the female role are stunning beauties and they can win hearts of the audiences easily. Now-a-days shumang leela has two types - 1) Nupa Shurnang leela, performed only by male artistes; ii) Nupi Shumang leela, performed only by female artistes. Earlier, shumang leela was considered only 'Dialogue leela' because dialogues dominated the entire portion of the shumang leela. Now, Eshei leela has substituted dialogue leela and is regarded as shumang leela. The distinctive feature of the Eshel leela is the music, which plays an important role in the shuman leela. Some of the great shumang leelas in the history of the Shumang leela are - 1) Imphal Babu; 2) Daku Jagat Singh (earlier it was named as Epagee Ibungo); 3) Abir Khan; 4) Pocket Mar; 5) Devadas; 6) Hamlet; 7) Keishamthong Thoibi etc. The above shumang leelas are best loved by people and performed at every nook and corner of the state (particularly in valley area). Some of the lines (dialogue line) are very popular among the people. A commoner can easily recite two or three lines from the above shumang leelas. Now, shumang leela has crossed the boundary of linguistic and cultural barriers and exposure gained to other societies also. 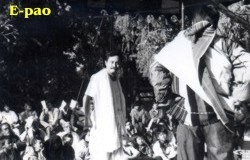 A group called 'Sanalelbak Nachom Artiestes' gave its performance first time in the history of the shumang leela at Meghadoot Open Air Theatre on the premises of National School of Drama, New Delhi, with a play 'Meigee Ching (Volcano)' in the year 2000. That was the first performance of the shumang leela among the non-Manipuri speaking audiences. The show was a huge success and the performance of the artistes easily won hearts of the elite audience of the capital of India. Not only common audience but also highly qualified critics appreciated it. Then the same group Sanaleibak Nachom Artistes was invited to particpate to the 11th Indian Peoples' Theatre Association (IPTA) at Thrissur (Kerala) held from January 12 to January 17, 2001. The tour was highly successful and it was much more than their (Sanalelbak) earlier expectations. Besides their show at Thrissur's IPTA Conference, they were invited to perform at some remote areas of the Kerala. They gave 11 shows at Kerala. On their return journey they gave performances at Dharwad (Karnataka), Prithivi Theatre (Mumbai), IMA hall (Nagpur) etc. They were invited to Orissia and Bihar also but they couldn't fulfill their wishes due to heavy engagements at home. They gave altogether 24 shows during the journey. At last shumang leela has reached the International audience. The high profile Sanaleibak Nachom Artistes was invited to give its performance at Bolshoi theatre at Moscow (Russia). They are ready for the international audiences in September, 2001. Like theatre and films, director is the most important person in the shumang leela. He designs all sorts of things shown on the stage. Now-a-days there is separate choreographers in some shumang leela groups. Few noted directors are Birjit Ngangomba, Wareppa Naba, Niladhaja Khuman etc. Among them Birjit Ngangomba is the most popular one. Whatever he directed has become a much sought after play. It has become a matter of pride to be directed their plays by Birjit Ngangomba. However, he is a theatre person as well as a martial artist. He won best director many a time in the All Manipur Shumang Leela Festival organized by Manipur State Kala Academy. He directed the blockbuster shw-nang leela 'Keishamthong Thoibi'. Playwrights are also important persons in shumang leela. Without their hard labour it is difficult to produce a good shumang leela. Few noted playwrights are Padmashree G.C. Tongbra, Chana Lukhol, Thangjam Birchand, Rajen Toijamba, Nabakumar, Gunachandra Sharma etc. Among them Chana Lukhol is still active in this profession. He wrote the 'Keishamthong Thoibi'. Some of the great shumang leela artistes are - Ayekpam Inakhunba (Devadas shaba or Manihar shaba), Jugeshwar (Cheitei shaba), Tondonbi (Paru shabee), Binod (Daku Jagat Singh shaba), Shamu (Abir Khan shaba), Brajabidhu (Hamlet shaba) etc. and many more. Here I mention only few familiar with audiences. Shumang leela changes its look according to time and situation however it remains its gravity without any change for a long time.